The directive has undergone a number of minor revisions since its inception in 2002. These include updates in 2006 and 2009. After nine years the Directive was seen as failing to achieve some of its goals, hence the legislation had been amended again. On December 20, 2011 the European Parliament and the European Council agreed on amendments to the Directive, subject to a second-reading vote, which was taken on January 19, 2012. The changes affect the method for calculating collection rates, which were previously four kg per inhabitant per year. To provide a transitional period of seven years to introduce the revised method of calculation, the present method is retained for the first four years from the time the amended Directive comes into force. For the next three years, commencing with the fifth year after the amendment, the calculation of collection rates will be revised to 45% of the weight of E&E products entering the market. Once this seven years transitional period is over, EU member states will individually select the actual collection options they wish to use. The overall aim is for the EU to recycle at least 2% of electrical and electronics waste equipment by 2016. The directive imposes the responsibility for the disposal of waste electrical and electronic equipment on the manufacturers or distributors of such equipment. It requires that those companies establish an infrastructure for collecting WEEE, in such a way that "Users of electrical and electronic equipment from private households should have the possibility of returning WEEE at least free of charge". The directive saw the formation of national "producer compliance schemes", into which manufacturers and distributors paid an annual fee for the collection and recycling of associated waste electronics from household waste recycling centres. The WEEE Directive obliged the then twenty-five EU member states to transpose its provisions into national law by 13 August 2004. Only Cyprus met this deadline. On 13 August 2005, one year after the deadline, all member states except for the UK had transposed at least framework regulations. The WEEE Directive was transposed into UK law in 2006, and was active the following year. The directive places WEEE into numerous categories, the first tier being historic and non-historic. Historic WEEE implies equipment placed on the market prior to 2005 and the WEEE directive places the onus upon the owner of the equipment to make provisions for its recycling. Where equipment was placed on the market after 2005, it is known as non-historic WEEE (denoted by a bar underneath the crossed-out wheeled bin symbol), and it is the responsibility of the producer/distributor to make provisions for its collection and recycling. The WEEE directive sets a total of 10 categories of WEEE for reporting purposes. Waste electrical items accumulate at a dump. Fridges and freezers, due to chlorofluorocarbon (CFC), an ozone-depleting substance. As of 2012 revisions to the regulations, all refrigerants are considered Hazardous. WEEE that is delivered to household waste recycling centres (HWRC), also known as designated collection facilities (DCFs), is collected by or delivered to approved authorised treatment facilities (AATFs). The waste electrical and electronic equipment is then weighed and categorised in accordance with the directive. Post re-processing (recycling), total volumes of each category are reported to the producer compliance scheme and the reprocessor is reimbursed accordingly. Totals of obligated WEEE for all AATFs are collated by the environment agency on a quarterly basis and reported to the EU. Historically, there were problems with the implementation of the producer compliance schemes due to a "double counting" and reporting of reprocessed WEEE to producer compliance schemes. This arose where obligated WEEE was partially treated by the first AATF to receive the waste, prior to it being passed onto a second AATF for further treatment. Both the first and second AATF would then claim against the same waste electronics, resulting in a "net debt" against the wastes being treated. The management of WEEE is applied via the waste hierarchy, with particular emphasis upon reduction of waste arising, re-use of equipment and recycling (recovery) of materials: Reduce, Reuse, Recycle. In January 2012, proposals were debated by the European Parliament to recast the WEEE Directive. The proposals included increasing recycling rates. Having been adopted by member states, the re-drafted directive now requires higher recovery rates of 20kg per capita per annum as opposed to previous figures of 4kg per capita. In April 2005 the Royal Society of Arts in the UK (in conjunction with Canon) unveiled a 7 metre tall sculpture titled WEEE Man on London's South Bank, made from 3.3 tonnes of electrical goods—the average amount of electrical waste one UK individual creates in a lifetime. 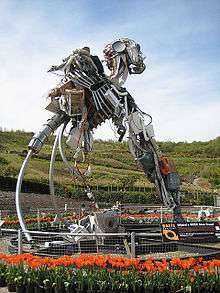 The giant figure was subsequently moved to the Eden Project in Cornwall as part of a UK tour. ↑ "European Standard EN 50419" (PDF). European Committee for Electrotechnical Standardization. Archived from the original (PDF) on 2 May 2014. Retrieved 9 April 2012. ↑ "European Standard EN 50419" (PDF). European Committee for Electrotechnical Standardization. ↑ European Council. "The Producer Responsibility Principle of the WEEE Directive" (PDF). ↑ Northern Ireland Government. "EEE Producer Obligations". ↑ Environment Agency (England & Wales). "Waste electrical and electronic equipment (WEEE)". ↑ Link, Business. "Obligations of electrical and electronic equipment users". ↑ Agency, Environment. "WEEE Categorisations". Archived from the original on 6 January 2012. 1 2 "The Hazardous Waste Regulations (2005) as amended (2009)" (PDF). Dept. for the Environment, Food & Rural Affairs. Archived from the original (PDF) on 17 June 2012. ↑ European Council. "European Waste Catalogue". ↑ "Recycling Computers- Legislation". IT-Green. ↑ Scottish Environmental Protection Agency. "Producer Compliance Schemes". Archived from the original on 15 January 2012. ↑ National Archives (UK), The. "The Environmental Protection (Duty of Care) Regulations 1991". legislation.gov.uk. ↑ Council, European. "Directive 2008/98/EC of the European Parliament and of the Council of 19 November 2008 on waste and repealing certain Directives". ↑ Agency, Environment. "Your Waste Responsibilities". Archived from the original on 3 January 2012. ↑ Project, Eden. "WEEE Man Sculpture, Eden Project, Cornwall". ↑ "Gallery". Weee Man. Archived from the original on 2005-08-20. Retrieved 2014-06-02. ↑ Veolia (2014-12-09). "Veolia joins WEEElogic as UK Partner". Veolia UK. Retrieved 2016-06-28. ↑ "WEEElogic - 1cc". Retrieved 2016-06-28.